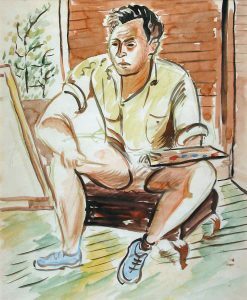 We are delighted to share with you the film Leon Bibel: Art & Activism in the WPA, produced by Park Slope Gallery on behalf of the Leon Bibel Estate. 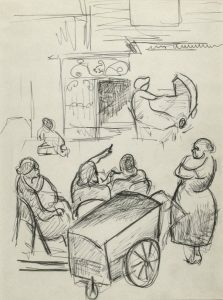 An earlier version of the film was shown at a 2011 exhibition of Leon’s WPA work in Philadelphia. With a major exhibition to curate and organize, there were considerable time constraints in the production of the film. We made many adjustments and expanded upon some aspects of Leon’s story after the exhibition had ended. Although it is still a short film, we made many targeted changes, added a host of new images, improved the audio as was possible, and properly thanked everyone connected with the project, as well as the supporters of Leon’s work. At last, it is ready for viewing! with the artist … hearing his stories firsthand … and having history come alive. 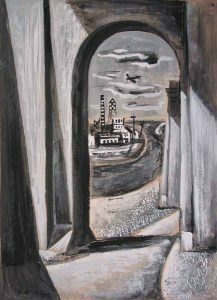 For a lovely review of the exhibition Art & Activism in the WPA in the Philadelphia Inquirer, please click here. It’s a rare privilege to get to know an established artist … one who has worked through many decades … through medium and stylistic change … whose studio is intact … and who is full of stories. Add to this a behind-the-scenes look at the most comprehensive public art project in the history of the country and the result is dizzying and wonderful. Leon Bibel was born in 1913. 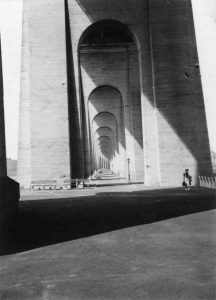 He studied at the California School of Fine Arts in San Francisco and in 1936, at the height of the Depression, he came to New York City, hoping to work in the WPA Federal Art Project. I first met Leon Bibel over 20 years ago. 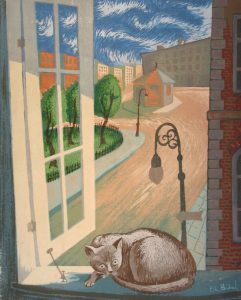 In 1991, a client recommended our gallery to a friend who had received as a gift a lovely 1939 silk screen print by Leon. The new client was quite surprised at how excited I was about it; I explained how much I was drawn to mid-century American art, and the WPA period in particular. She told us that she had grown up in rural New Jersey and that her parents and Leon had been very good friends for many years. She also said that Leon had a treasure trove of artwork in his studio that might interest us. She added that he was a wonderful person and that we would surely enjoy meeting him. Mitch and I were very intrigued, but this conversation took place during (another!) terrible recession. We actually put off connecting with Leon for quite a while because of the considerable expense in taking on a new artist. Leon was aware of our interest and wondered what was going on. We were quite stunned to see just how rural the setting actually was. Leon’s home and studio was actually part of a farm that was on an old mill road. There were chicken coops and several old houses on the land. There was a vegetable garden and flowers, and it was so removed from the kinds of WPA industrial and city imagery that I was very fond of, I didn’t know what to expect once we went inside. His art was on the walls of the living level, but when we went upstairs to the studio, there was an incredible surprise. Here was evidence of the threads of his entire life as an artist … something quite remarkable. Paintings, screen prints, and stone lithographs lined the walls and leaned against almost every surface. There were books of linocuts. There were handmade wooden file cabinets for his prints. There were many chairs for the visitors from schools and other groups who would come to hear Leon talk about the WPA. There were some original silk screen frames that Leon used for his talks. There were printing-related tools and paintbrushes and slides and photographs, clippings, letters, … all of which he had saved going back to his days as an art student in California some sixty years before. Most compelling for an art historian, though, were the sketchbooks … amazing documents that showed the arc of his artistic life. It seemed as though he could have hardly ever been without one in hand. These books showed the very earliest drawings and watercolors for pieces that later developed into full-scale paintings, silk screens, and stone lithographs. The drawings showed persistence and consistency as he reworked ideas that moved him. We would find a mere wisp of a sketch in pen and ink, perhaps another drawing that was more realized and then the notion may have morphed into more finished work. There were some very delightful surprises as we combed through the material. 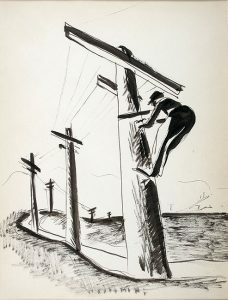 For example, we noticed how often telephone poles appeared in the drawings, providing an engaging compositional element. We realized that in the 1930s, they were a fairly new reality on the landscape for most people. This phenomenon reminded me that a photographer we represent, George Forss, had had a difficult time incorporating the Twin Towers into his compositions because they so changed the landscape, but as soon as the radio tower went up, he was able to completely embrace them in his work. Telephone poles seem to have enchanted Leon in a similar way. It is so unusual to have this kind of material to support the later, “finished” work, but it was enhanced even more by other kinds of materials he saved. There were exhibition announcements and lists, original photographs that were the source for some of the paintings and silk screens, his Artists’ Union membership cards, and WPA work schedules dotted with drawings, showing his preoccupation with what was happening in Europe. There was a profoundly disturbing clipping of a lynching in the South from a contemporary-to-the-event newspaper. It became the basis for a remarkable painting he did in 1937, The Lynching. While planning a retrospective of Leon’s WPA work in 1994, Mitch and I spent more time in his studio, going through materials and discussing the WPA. Leon related his experiences with great clarity and affection, saying that it was a miracle to be paid to do what he loved. 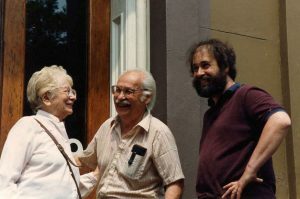 He spoke of the camaraderie among the artists who supported each other’s efforts in many ways, eagerly sharing techniques, supplies, and information. Leon was hugely mindful of the degree to which he was shaped by the different forces in his life, which is why we believe that he saved many of the materials that set those experiences in stone. His early days of study in San Francisco opened him to many influences: letters from teachers like Maria von Ridelstein were carefully kept as they meant so much to him. The relationships with WPA artists and teachers were intense, active, and engaging. There were many protests against the Fascists in Spanish Civil War. Then there were protests against the United States government for ending the WPA Projects as war became imminent. From the mid to late 30s, Leon had worked on a series of documents, which he sometimes illustrated, basically an art “diary” called We Achieved. He chronicled those times by delineating his various paintings, murals, and other works as they progressed, sometimes adding very revealing comments as to his process. He photographed all of his artwork very early on, which showed astonishing prescience. He was only 20 years old and yet he seemed so centered! I realized that it would be possible to contextualize this art and this artist. 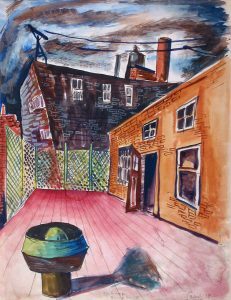 There would be a way to substantiate his place in American art of the mid-twentieth century through the broad themes and stylistic connections of the time. in evidence all around us in the studio. 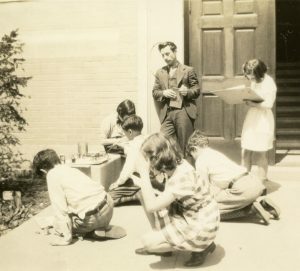 Whereas many artists just starting out might have more of a peripatetic life, Leon fell in love with Neysa, a teacher he met while working on his first WPA teaching assignment. When the WPA project ended, they moved to rural New Jersey. They settled in a community where quite a number of artists lived and worked on their art, but primarily showed in New York City, such as George Segal and Allan Kaprow. When Neysa passed away, her family asked that we continue to represent the estate and we helped to close up the studio, which had been in use for more than six decades. Although we thought that in our many visits with Leon and then Neysa, we had gone through absolutely everything, when we worked on this “closing up” project, there were yet more boxes and many more materials. Our task was clearly not done. The film we are introducing online was originally made to accompany a 2011 exhibition of Leon’s WPA art at the Gershman Y in Philadelphia. We were lucky enough to have some old videotape footage of him being interviewed in his studio as well as 8mm films of protests and parades from the late 1930s that were converted to digital files. We were able to intersperse items like his Artists’ Union Card, images of him in the WPA years, exhibition catalogues of the Federal Art Project in NYC, etc., to give a comprehensive sense, even in a short film, of those times … and Leon’s sense of them. Leon often referred to the “Dark Days of the Depression” as the happiest of his life. His eagerness to hold on to the various hardcopy elements of those times made perfect sense. The stability in his life that followed: a long and happy marriage, never moving, and having no space considerations forcing him to whittle down his memories, made possible the recreation of the arc of his life as an artist and activist. This unusual set of circumstances provided insight to a critical period of American art and history, and the documentation on which this film is based.